Adnauseam formed in 1987 under the name Decimation. With original members Brian Kohn-drums, Jake Seay-guitar, Chris Harrison-Guitar and Christian Petersen-Bass/vocals. With the rising death metal and grind core scene surfacing in Europe Decimation was slowly changing their style of writing, becoming faster, vocals becoming deeper, guitar tuned down. They were highly influenced by this new genre blasting out the thrash competition. After several basement tapes Decimation went into the studio and cut a 4 song demo entitled Manifestation of terror. This demo was only really passed out to friends and a few local magazines. The demo did get good reviews but it still did not really capture the essence of what they were trying to accomplish. Later on in 1990 Jake Seay left the band to pursue his professional career. Going on as a 3 piece Decimation changed their name to Adnauseam, now fully a death core act they revamped most of their songs and Chris Harrison started some growling of his own and some definitive screams. Thus, Chris and Christian would trade off vocal duties from now on. They recruited long time friend Steve Goldberg and they headed back into the studio. This time cutting another demo entitled another horror of life. 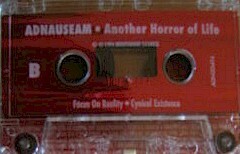 The demo got excellent reviews and launched Adnauseam to start playing outside of Colorado. In early 1996 Christian left the band to play with DISMEMBERED FETUS, he was drafted into the band as a guitar player and this is something he had never done and could concentrate on just one instrument. This leaving the bass and vocals duties vacated. Quickly Adnauseam gathered themselves and recruited Zac Jo to play bass and handing off all vocal duties to Chris Harrison. Just one month later Adnauseam entered into the studio to record their debut, Desire, Aspire, Inspire, Expire. Pro Printed covers and tapes.